I’m writing you from somewhere between Fresno and San Jose, California. Cool show tonight and last night, but then I would say that about the whole tour! That’s nice that I can say that and believe it. It’s been a good run on this “Crazy Love” tour… it’s a little sad that it has to end in about 4 shows! I don’t think any of us have really given it much thought. It will just be the last day a week from now and that will be that and we are only left with “Memory Lane”. It has always been fun and pretty care free on these tours. Most of you know that one of my favorite past times is playing Ping Pong. MB and I go rounds and rounds of trash talk. It’s so entertaining to me and I guess to everyone around us. The idea is to say or do something that goes beyond what anyone expects… like today :-). MB was looking really down and I said “What wrong?” He stalled for a moment giving me an opportunity to think “wow, something really bad has happened”. He then said “Roger, I’m just too good at this game… I’ve beaten everyone on the table today and I know you’ll want to play me, but you’re really no challenge for me and makes me sad to have to tell you that.” Wow, that was GREAT! Even when I begged him to come to play me… he just walked away and said “there’s no point Roger”. Funny, funny, funny… he did this all with a straight face. It is true that I have had a hard time beating him recently, but today I felt that feeling… you know the feeling that you’re unstoppable. He finally came out to play and I took him down! 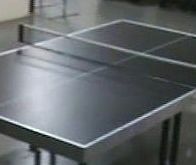 I’m going to miss that Ping Pong table and all this competition with MB, the band, N7 and the crew. It’s really been a family like one I don’t expect to be part of again in as a “support band” roll. I’ll probably write more about it when it ends in a week. We estimate we’ve sung for about 3 to 4 million people on both tours since 2007. We are still very appreciative for the opportunity. It’s kept us super busy because we’ve done our solo shows in between all this heavy touring. It’s been a blessing. Right after this tour we take 2 days off and head to Washington DC for the Martin Luther King Jr National Memorial. We are absolutely honored to be part of it. Sharing the weekend with so many great artists. I’ll be sure to write and give you all the details after that weekend. Just want to take this time to thank all of you reading this and supporting us always. I really appreciate it. This entry was posted in Roundtrips and tagged Bowling, Crazy Love, El Paso, Fresno, Michael Bublé, Ping Pong, San Jose. Bookmark the permalink. We caught your show last night in Fresno. Excellent! The music and the mood were electrifying! it shows that you love what you do. Thank you for coming to Fresno, and I hope to see you again soon! How wonderful that you will travel to DC for events related to the MLK memorial — please say when you’ll be taking the stage! Love you guys! Hope to see you in South Florida soon…. You guys were AMAZING last night! Thank you for a fantastic show! Caught your performance in Fresno, you guys are amazing!! The crowd loved you, it was lots of fun!! MB was fantastic! I saw you Saturday night in San Jose and was blown away. Naturally 7 was great. I was disappointed that you ran out of cds and did not have a chance to buy one. Good luck to you and I will be watching for you to return to California as headliners! We were in the audience last night in Fresno and I was blown away with the talent you all have. Hope to be seeing you do great things and thank you for a wonderful evening. I am so glad I got the chance to see you at the MB concert in San Jose. I was not expecting to be totally blown away by the opening act! You guys are a m a z i n g! I didn’t know it was possible for those sounds to come from a human voice! I was lucky enough to buy your cd/dvd and meet you all after the show (love your positivity)! I was so excited to spread the word to friends and family that you guys rock! Thanks for making a great night even better. Keep up the good work and I hope to see you headlining sometime in the near future! You guys are amazing! I am so glad I got to hear you perform in spokane,WA..my parents and I really enjoyed you. Keep up the great singing! I keep a good memory when i see you for the 1st time in Germany with MB, then ion Belgium in Antwerp, and Paris, London eand finaly in my small town in France : QUIEVRECHAIN in june 2009 Do you remember ? I feel a lot of nostalgia after year with the crazy love tour… So I would like to have a email to write to you all. You said that you will be in Washington DC but when exactly, because Lydia, Lea ans me going to washington DC from 19 until 29 august. I’m 15 years old, and I went to the show in Fresno. Usually I expect the opening act to not be as great, but you guys were amazing. I don’t even know how many concerts I have been to, but that had to have been the best…not one of the best…THE best. Michael Buble just got to my heart. Naturally 7, you are all very talented and should really keep it up! I enjoyed the show so much to the point where I was in tears. It gave me chills, and I loved it so much I just couln’t sit down in my seat. Thanks for puting on such a great show. Come back to Fresno soon!! I promise I’ll be at every show you guys and Michael Buble put on over here. Saw you all last night in El Paso and all I can say is WOW!!! You guys are amazing. My friends and I all agreed that we would pay just to see you all again.